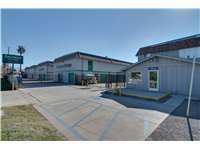 San Bernardino Self Storage at 875 E. Mill St. Located on E. Mill St. between S. Lena Rd. and S. 2nd Ave., Extra Space Storage serves San Bernardino residents near North Norton, Stadium West, East Valley, Valley View, Marigold, Valley College, Colton, and Lytle Creek. Locals will recognize our facility just west of San Bernardino International Airport near the San Bernardino National Forest Headquarters. We're also accessible for residents of nearby apartments, such as Arbor Apartments, Creekside Village, Meadowbrook Park & Tower, and Arrowhead Vista Apartments.